Although I was glued in front of the television all through childhood and my teenage years, watching such gems as Silver Spoons, Alf, Small Wonder, The A-Team, and Saved by the Bell, my career kinda got in the way once I became an adult and my prime time viewing hours were reduced to about an hour and a half a week. I'm not quite sure how I stumbled upon the 1st episode of Lost (maybe it was subliminally planted in my head cuz I work at Disney), but I've been hooked on it since the premiere, and it's become the one show that I do watch religiously every week. The combination of an original premise, an amazing cast of characters, and the ever-growing feeling of never knowing where the story is taking you have all made it the most addicting show I've seen in years - well, at least since Charles in Charge went off the air anyway. 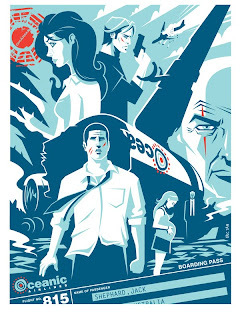 So you can believe my fanboy freak out when I was asked to contribute a Lost poster to a series of 16 that are celebrating the show's final season. Each of the artists were given a particular theme from the show and mine was simply called "The Crash." After re-watching the pilot a few times, I realized that the episode follows the plane crash through Jack's eyes. That's where the concept for my poster originated. With Jack as the central figure, all that surround him are the characters and events that fill his storyline - from the love triangle, to the fight for leadership against Locke, to his family ties to Christian and Claire. I used the crash theme as the catalyst to Jack's arc of the series. The color palette is directly pulled from the Oceanic Airlines logo and Dharma logo acts as a 'stamp' that lets you know who's responsible for all of this craziness. It was definitely an honor to be asked to put my spin on the one series I gladly invest in each week. I hope all you fans of the show dig it and I definitely can't wait to see how the story ends. Check out the rest of the Lost poster series at Damon, Carlton, and a Polar Bear .